I wish I could sleep as well as my cat. He lies down on basically anything – it doesn’t even have to be flat – and is asleep in a matter of seconds. And if this card is anything to go by, krakens don’t necessarily wake up even when they produce mana. Cats like to lie in the sun, which some people avoid for alleged health reasons; and krakens spend their entire lives encased in water, implying much more constant pressure and temperature. Apparently we hominids made the wrong evolutionary choices. Arixmethes is hilarious in all the right ways. He’s a land with a mana cost, and the type Kraken. But he won’t be affected by, say, Engineered Plague when you play him (and let’s face it, he and all krakens are barely affected by it when they are creatures). You can use him as an expensive mana acceleration card and nothing else, or go all the way the other way and jam lots of cantrips and cheap ramp spells to get an incidental 12/12, and everything in between. And if you want to port Kiora’s deck from Duels of the Planeswalkers 2012 to paper Commander, I can’t think of a cooler general to use. A four-mana 12/12. Must be a drawback, right? And there is one. Arixmethes is a big, cantankerous kraken that only wakes up when enough magic has happened. Until that time, it is a land. Specifically, one that taps for two mana. Due to how Arixmethes is worded, it’s actually not a creature when it comes into play, though coming in tapped by default makes it less appealing. 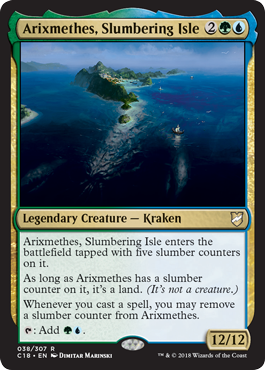 That said, green and blue have a ton of cheap spells; Arixmethes could well come online as a creature the turn after you cast him by chaining together a bunch of cantrips…and even as merely a combo piece, tapping for multiple colors of mana means you can pair Arixmethes with untap effects to really create chaos. The major downside to Arixmethes is that it has no form of protection once it wakes up; it’s just a 12/12 with no combat abilities. And that, sadly, is what consigns it to a cool but mostly useless card, as you need to jump through a lot of hoops to get it to do what you want. There are decks that may have trouble dealing with a 12/12, but those decks would likely fold to any real threat to begin with.